A good number of users said the Hoka One One Speedgoat 2 has great traction. Most runners were satisfied with the cushioning provided by this shoe. Some buyers felt that it provided terrific support and were satisfied with the comfort level. One user commented that the Speedgoat 2 is good enough to be used for minimal hiking sessions, but excellent for trail running. A couple of buyers mentioned that it did not take a long time to break in and that it did not give them any blisters nor pain during their first few runs. The Speedgoat 2 offered excellent ankle support, one user stated. Another buyer said that it is durable enough to withstand technical trails and rocky terrains. Most of the buyers were amazed at the lightweight nature of this running shoe. A lot of buyers deemed the Speedgoat 2 too narrow for their feet and that it was not able to provide adequate toe room. A couple of users experienced discomfort after wearing the shoe for a long time. Some users commented on the Speedgoat 2’s tongue construction: several mentioned it needed to be wider, while another one said it needed to be gusseted completely; one other user said it required more padding. The Hoka One One Speedgoat 2 is a great redesign and thus an improvement of the original Speedgoat. As a trail running shoe, it is not recommended for road-running, but it does very well on groomed trails requiring little to moderate efforts. Many of its users have had positive experiences with the shoe’s comfort, protection, and traction. While it is designed for tougher terrain and is compatible with long distance running, some users do not recommend the Speedgoat 2 for high and sloping routes. Overall, consumers believe that the Speedgoat 2 is worth their money despite its expensiveness. The Hoka One One Speedgoat 2, which bears the nickname of Karl Meltzer is truly a mountain running shoe to be reckoned with. While I am neither as speedy nor as agile as a mountain goat, I felt like both when I tried out my first pair of Speedgoat 2 on the trails above Missoula, MT. The Hoka One One Speedgoat 2 fits like a glove right out of the box. After only a few miles, the shoe was ready to go. The lace cage locks down on foot very nicely and provided a secure feel without any sense of too much pressure on the top of the foot. The heel counter envelops the heel comfortably, and zero slippage was noticed when running in it. The midfoot cage construction used by Hoka locks the foot into place firmly. The ankle collar is amply padded for a nice hugging fit. With a light and responsive feel, the Speedgoat 2 is one of the most comfortable trail shoes I have ever worn. It is more flexible than its predecessor, with a softer, more broken in feel than the original Speedgoat. 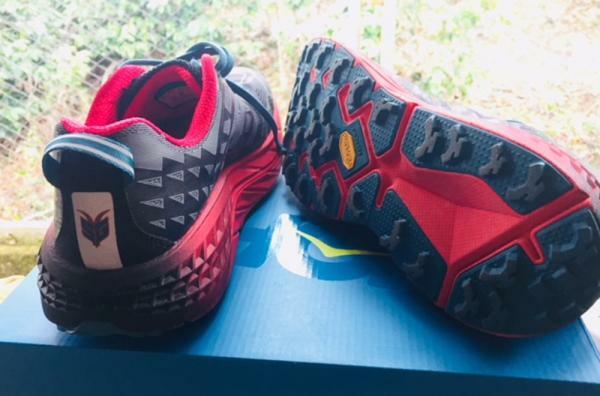 I purchased these shoes toward the tail end of this last season with the intention of breaking them in and using them as my primary trail runner in the spring. However, I liked them so much that I ended up using them in my last event of the year, the Hootenanny 100K. After a few short runs to break the Speedgoats in a little, they felt like home, and they were my go-to shoes for my last few long runs leading up to and during the 100K event. Trail running shoes always seem to fall on one side of the weight/durability fence. Either they are nice and light but lack the support, cushion, and grit, they need to hold up for the long haul, or they are burly as a tank but weigh in as such too. The Hoka One One Speedgoat 2 seems to have it all. These shoes are built to withstand a rugged course but as light as road racing shoe. Right in line with what Hoka is known best as a maximally cushioned shoe. The extra EVA cushion is a welcome asset on the long course. That combined with the 9.8oz weight make it the perfect Ultra-distance shoe. Weighing 9.8 oz, it is almost as light as some minimalist shoes or racing flats. Throughout the 62 mile race, I ran with comfort, and it never wavered. The EVA cushion kept my feet happy, and the uppers swaddled them comfortably. The uppers are constructed of a tough fabric that is strategically accented with ventilating mesh to keep your feet aired out. The fabric is plush enough to provide a padded feel but not too thick that it holds water weight more than usual. The cushion on the Speedgoat 2 is dialed in perfectly. While not as plush as the Stinson ATR 4 or as lean as the Torrent, the Speedgoat 2 offers a happy medium that keeps the shoe light and nimble, yet cushioned enough for any nature of run. The Vibram Megagrip sole feature especially wins me over. The Vibram company has never let me down with high quality and tenacious sole with grip and longevity. This shoe is no exception. The 5mm lugs gripped anything and everything I threw at them - mud, gravel, boulder fields, talus, scree… it didn't really matter; the Vibram sole handled it all with ease. I especially liked the well thought out lug spacing. Unlike some brand’s lug pattern, I had no problems with pebbles and debris getting stuck in between them or with clay and mud getting packed on the bottom. The slight angle of the lugs on the outer edge of the sole helps with reducing lateral slip and increase your stability. The midsole has a nice wide profile that helps keep you stable in varied terrain. Combined with the CMEVA midsole material for extra cushion and support, the Speedgoat has a very solid feel on the ground. At no point did I ever feel tippy in this shoe, despite its higher stack. The nice wide base easily compensates for any stack height issues that might otherwise occur. On the trail, the Speedgoat 2 feels agile and responsive, yet gritty enough to tear up any challenge you throw at it. Some of my most recent runs in this shoe have been on mixed snow, ice and gravel pedestrian paths and the traction has been superlative. The Upper material of Speedgoat 2 offers a mix of abrasion resistant nylon material that is water resistant and well-positioned mesh that allows the shoe to breathe. The material has held up to anything that I have thrown at it, and there is little sign of wear on the uppers. The reinforced toe area is a nice feature that offers a bit more protection in the front. As mentioned earlier, the Vibram sole is a rock star. After 134 trail miles on very aggressive terrain, the soles have little sign of giving up. The Hoka CMEVA foam of the sole is retaining its cushion true to the performance that Hoka is known for. Like the Stinson ATR 4, the Speedgoat 2 has a strategically placed piece of more flexible nylon right in front of the laces. This high flex area benefits from this and keeps the shoes from pinching on your foot or wearing out prematurely. Anyone looking at the Speedgoat 2 has to acknowledge the bright array of color options offered by Hoka. While most brands offer 2-3 colors, the Hoka team outdoes themselves by providing an astounding 9 options. All of these are bright and bold and promise to stand out in your wardrobe. It is a well cushioned, lightweight, high-traction trail shoe that is built for long distance trail running. The Vibram soles have excellent grit, and the shoe can handle any terrain thrown at them. Weighing in at 9.8 ounces, the Speedgoat 2 feels like a road racing shoe but performs like a beast on the trail. I liked these shoes so much that I bought a 2nd pair to shelf until next season. The Speedgoat 2 will be my choice for the coming ultra-season but would be a great shoe for anyone looking for an all-around performer on the trail. At an MSRP of $140.00, it’s worth every penny. Hoka One One Speedgoat 2 - WOW! What an Improvement!!! Since, falling in love with Hoka One One Speedgoat 2. Shining new colors to choose! And, of course, with a Vibram Megagrip outsole with many curved studs, the Speedgoat 2 takes pride in its grip and cushioning in long kilometers on difficult terrain and loose ground. Its broad form and the new engineered mesh are ideal for long training. This is where the Speedgoat 2 shines and shines! Last October, I got a new pair of these lovely puppies! Next day, I hit a technical short run with some pavement sections, steep and not so friendly hills, some water creeks pass, and very funny downhills. For this pair, no surprises on grip or pain on toes. The redesigned outsole is well done. You feel confident cornering in the loose soil and the fit is superb. I do not have a wide feet shape, however, I have been running for a long time on Altra’s wide shoes. Honestly, in these shoes, I don’t miss that, they are wide enough. I ran my last Ultra in a very hot and hard terrain course for around 51k and the feel of the shoes was fine. There was no need for a shoe change and I did not feel any pain in my foot. They do the job very well! The cushion does not feel like a big pair of pillows on your feet, it is responsive enough to push you to run for hours without suffering pain. The rocket shape plus the drop of 5 mm to 4.5 mm helps to make the feel of the run smooth and gentle. It's a well-balanced trail shoe! If you had run on the first version of the Speedgoat, you'll notice that it showed a weakness in cornering. The light upper was not strong enough to hold the feet on the shoes. The good news is that in the Version 2, the improvement on the upper fixed the issue. Now, on my runs, they stay in the shoes. You don’t feel anymore that sensation of “lose-your-feet-out-of-the-shoes”. Also, if you need to pass a river, they don’t get heavy holding water. They drain the water very well, no problema! If you take time to put the Speedgoat 2.0 side by side, the uppers are totally different. If you move them upside down, you'll also notice different shapes of the outsole. The only thing equal is the Vibram brand out there. Somehow I’ll say that V 2.0 is a brand new shoe rather than a redesigned model. Even the tongue was redesigned. There's more padding there but still, it is a soft tongue, you won’t notice or feel bulky in the top anyway, nice! The reinforced side of the outsole is superb. Looking at the colors, the shape of the carved channels, I simply love it! Hoka put a lot of attention on the details of these shoes. If you love running in all kind of trails for hours without a care in the world, then Hoka One One Speedgoat 2.0 is a good choice. If you have a neutral run and doesn’t care about the 4.5 mm drop, again, this should be your trail shoe of choice. Finally, if you like a bit of color in your running equipment, then definitely the Speedgoat 2.0 is the one! The Speedgoat 2 isn't just a much improved shoe over version 1. The Speedgoat is a good trail shoe. I'm glad I have it in my arsenal. I'm keeping it around for as long as possible until it completely melts away. I'm enjoying my time with it. Although the Hoka One One Speedgoat 2 retained some of the features of the original Speedgoat, there are more essential and relevant updates that users are sure to notice upon wearing. The base of the shoe is widened for added stability and increased traction, while the new midsole creates a platform that provides reinforcements to where the feet need them. The overall wider construction of the Speedgoat 2’s platform is done so that there is a stable base, which is important when running on challenging trails. The Vibram MegaGrip outsole has 5 mm multi-directional durable lugs that are patterned to be suited for technical mountain terrain. While the cushion, traction, and weight are the same with the original Hoka One One Speedgoat, this second version has updated its fit, platform, and upper to deliver the sensation of a maxi-cushioned trail shoe. The Hoka One One Speedgoat 2 is a neutral running shoe best for wearers with narrow feet. This shoe is not recommended for those who have wide and high-volume feet, and not for runners who prioritize ground feel over cushioning. Average-sized feet might have a little compatibility with the shoe, but the relatively small toe box is a limiting factor. The available width for the men’s version is D – Medium, while the women’s version is B – Medium. The Hoka One One Speedgoat 2 has retained the Vibram MegaGrip Compound, which boasts an excellent grasp and on uneven technical trails. The flex grooves are now made deeper and more reliable to stick to rocks and wet soil. They also allow the user’s foot to better grip hard-packed surfaces. The midsole of the Speedgoat 2 employs the MetaRocker technology, which gives a fulcrum effect that’s similar to a rocking chair. This ensures that the wearer’s form remains as natural as possible while allowing an efficient movement from impact to toe-off. The injected EVA is relatively plush and oversized, resulting in the signature cushioning of the Hoka One One series. It is also designed to absorb shock and sustain long-term use. The cushioning of the Speedgoat 2 has a high stack height, but not at the expense of the weight nor the stability. The most recent iteration of the Speedgoat also makes use of this midsole material. 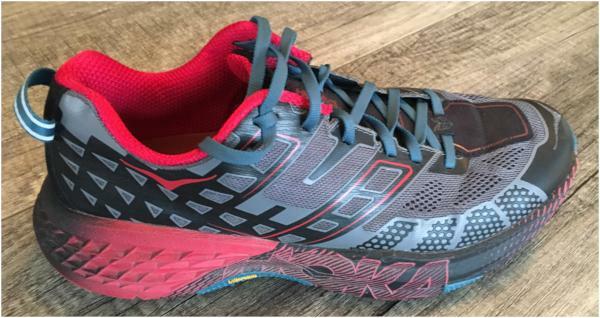 The majority of the updates on the Hoka One One Speedgoat 2 can be seen in the upper. This shoe uses its 3D Puff Print mesh, which has an open-engineered construction, to maximize breathability and support on the trail. The upper also has welded speed frame overlays that aids in foot steadiness and resistance to abrasions and tears. The reinforced toe cap is kept at a minimum, but it packs on the protection. The Speedgoat 2 uses elasticized laces that have a flat shape. This design allows the laces to stretch, therefore keeping the pressure on the foot at a minimum.